There is a direct connection to having a toddler and uptick in the amount of finger foods we eat in our house. Granted, even some foods I wouldn’t consider finger friendly become so but that’s just life with a small child. However, sandwiches, quesadillas, and fritters are all weekly staples. 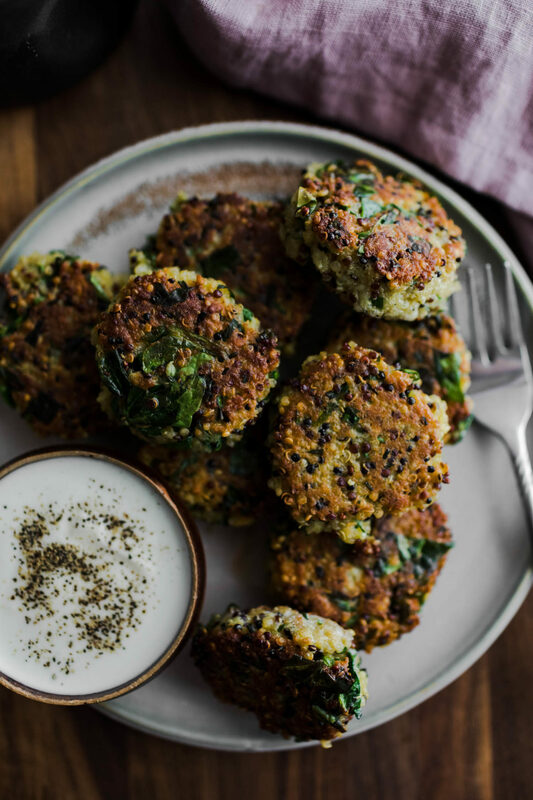 These quinoa cakes have been around for a bit but I’ve updated it to be a bit easier and really, just better. You can serve them by themselves but they also work on salads or even tucked in a pita. I like to make a big batch and use them as after school snack with these easy yogurt sauce. Some quick notes. The yogurt sauce is better after it sits for a bit. I highly recommend making this first and letting it rest while you do everything else. As for the quinoa cakes, they can be a bit delicate. I recommend slightly wetting your hand a bit before shaping. This greatly helps the cakes not stick to your hands. Greens: Swap out spinach for shredded kale or chard, just make sure to remove the stems first and shred the greens. Grains: If you’re looking to use something other than quinoa, I’ve had solid success with bulgur and millet. The smaller, quick cooking grains are perfect. Sauce: Doctor the sauce with your favorite add-ins. I love using harissa or more herbs in the yogurt or swirling in romesco.